Wild-caught Haddock with garlic herb butter. Is it deliciously easy, or easily delicious? 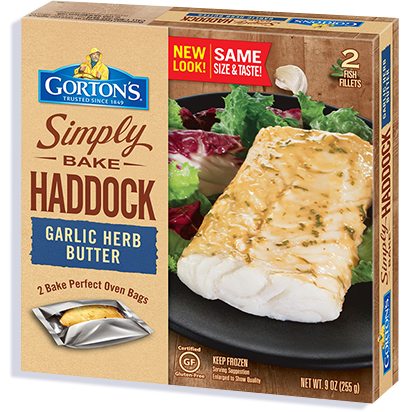 With our Simply Bake Haddock Garlic Herb Butter, it’s both. The Bake Perfect Oven Bag guarantees restaurant-quality haddock every single time, so you can enjoy dinner without worrying about the prep or cleanup. Water, maltodextrin, canola oil, corn starch, sea salt, butter (cream, salt), garlic powder, natural flavor, nonfat milk, citric acid, parsley, xanthan gum, colored with turmeric and annatto extracts.